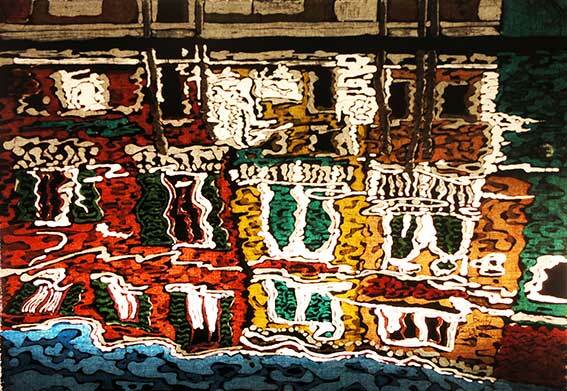 One sunny day on the island of Murano (famous for its Venetian glass) I took a photo of the canal with these amazing reflections on the surface. It was like a mirror, showing the brightly coloured cottage houses which line all the canals on the island. The reflections sadly, are so good because of the pollution in the water. The only other place I have seen such good ones is in Gas Street Basin in Birmingham! When I got home, I had this abstract picture in my mind and drew it out, on the cloth. The piece sat waiting on the corner of my work table for months. It was so complicated to achieve what I wanted , I think I was too scared to start. I feel I've spent my whole batiking life (over 50 years!) trying to conquer reflections, trying to get the free flow of the wax to capture the 'liquid' look of water. 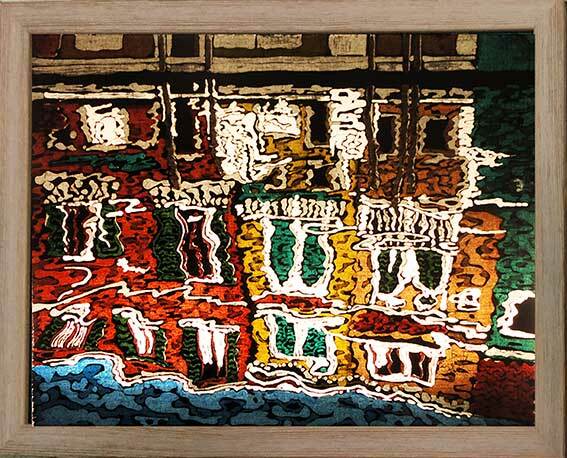 This study of reflections in Venice is probably the most challenging so far! Because of its almost abstract style, I felt more free to express myself and got quite brave with the speed I needed to lay down the hot liquid wax to get the fluid lines. It's only small (about A4 size) so it was really complicated to work on and I worked in short stints to avoid mistakes so easily made when I'm tired. These days though, I'm working for pure pleasure, away from all the pressures of the past, so can I spend as long as it takes to get things right.